Iran thinks Netanyahu's warnings that it is approaching the "red line" are funny. Iran on Tuesday scorned as a "laughing matter" warnings by Israeli Prime Minister Binyamin Netanyahu that Tehran is moving closer to making a nuclear bomb, AFP reported. "The claim of the Zionist regime, is a laughing matter," foreign ministry spokesman Ramin Mehmanparast said at his weekly news conference. He added that the "Zionist regime is a great violator and an illegitimate regime" that had "illegally stockpiled nuclear warheads." "They threaten to use these nuclear warheads against other countries," he said, adding that Israel was the "biggest obstacle" to the creation of a nuclear-free Middle East. Netanyahu said on Monday that Iran was now closer to crossing the "red line" after which it would be able to build a nuclear weapon, but had not yet reached that stage. He also asked for "stronger pressure and harsher sanctions" on Iran to prevent it from crossing the line. Netanyahu has criticized Washington for failing to set its own "red lines" that would trigger military action against Iran, whose leaders have repeatedly called for the disappearance of the Jewish state, and denied the Holocaust. The Islamic republic denies Western claims it is seeking atomic weapons and insists it is enriching uranium to 20 percent purity -- a short technical step from the 90 percent needed for a nuclear bomb -- for a medical research reactor. 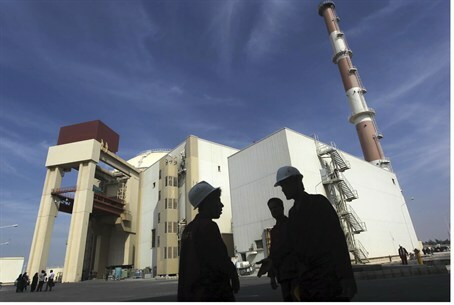 Mehmanparast asserted that the process of the converting "20 percent enrichment to fuel rods," for the Tehran Research Reactor is "ongoing," and all of the conversion is reported to the International Atomic Energy Agency.